4.94 out of 5 based on 71 user ratings. 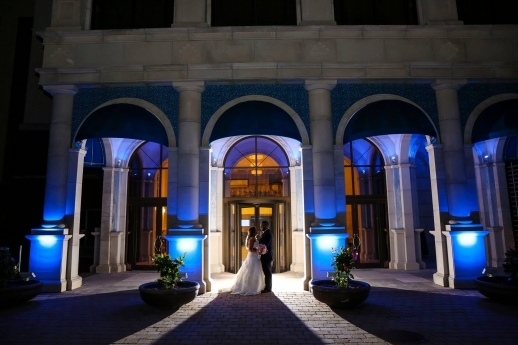 We had our Wedding here 6-5-16, and it was amazing!!! The whole team was outstanding - Craig Alexander, who we worked with from the beginning always felt like family and any questions we would have he would always address. Jayme who detailed the wedding was excellent and again any questions we had she always addressed. The day of wedding we worked with Carlos who was the captain, Lori who was the maitre d’, and Ashley who was the bridal attendant. They were great and kept the day running smoothly. There was never an empty glass, all 3 came over to us if we needed anything, and the guests were really happy. The day we got married it did rain, however, all of the aqaurium is beautiful, and again, the set up was perfect and on point and it turned out to be better than our original set up had it not rained. I also just wanted to give a special shout out to my bridal attendant Ashley - prior to the ceremony, we took pictures outside where it was very humid, my hair was a mess, she came to the rescue prior to the ceremony, she re-curled my hair, and was able to get the veil on! She also saved us some food and took everything from the bridal sweet to the hotel for us. Ashley went above and beyond for us that day and we will always be greatful for that. All in all if you want something different, yet still the "long island" type wedding, this is the way to go! We got married here on 12-2-16 and we would have to say that we had an exceptional time and experience. The only reason we didn't give 5 stars across the board was because of a communication issue that we and one of their staff members had. Other than that I would definitely have another event here, people are still talking about our wedding and not ONE person had any complaints. 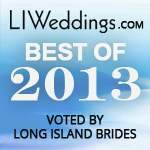 Our ceremony was in the tent and our reception was in the main aquarium, between the tent set up, aquarium and the DJ everyone had an amazing time. We still have people coming up to us telling us they have never been to an event like this and the tanks in the background made it even more spectacular. The price was reasonable! If you want an amazing night to remember......book this venue, you will NOT be disappointed!!! A class act all the way. Karen the banquet manager is very attentive and organized. Lori the maitrd is a pleasure to work with and knows her job in and out! Food was excellent, way better than most catering venues. Location and decor are perfect, I wouldn’t change a thing. Keep up the great work Atlantis!!! Looking forward to my next event there. We hosted our 20 year HS reunion here last weekend, and it was seamless and outstanding! Michelle, Caryn, Jayme, Bryan, and the rest of the staff were wonderful. The pressure of planning the perfect event for classmates you haven't seen in 20 years was a little overwhelming, but I didn't have to worry about a single thing during the entire process, and more importantly the evening of the event. I was truly able to enjoy myself. My classmates had a wonderful, memorable evening. This is a night we won't soon forget. This venue has proven to be perfect for all events, not just weddings. I look forward to working with you again in the future! We held are holiday event there yesterday and everything was amazing! The staff was great, the food was delicious and the atmosphere was beautiful!!! A once-in-a-lifetime celebration deserves a one-of-a-kind setting. 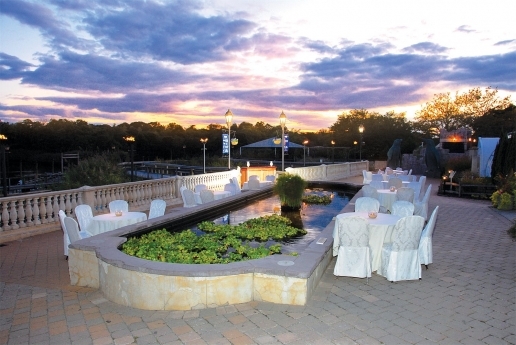 From our picturesque indoor waterfall to our breathtaking 120,000-gallon Lost City of Atlantis Shark Exhibit to our spectacular Sea Star Ballroom overlooking the scenic Peconic River, Atlantis Banquets & Events provides a unique backdrop for a wedding reception you and your guests will remember forever. 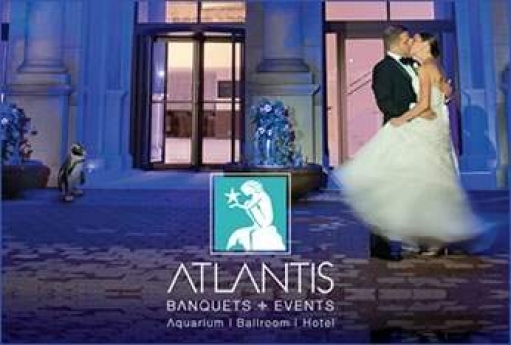 Hosting only one reception at a time, Atlantis Banquets & Events can accommodate functions from 20 to 650 guests. With settings as diverse as the Riverside Pavilion, popular for wedding ceremonies and cocktail parties, the whimsical Coliseum Room, where the walls are alive with gorgeous tropical tanks, the magnificent Sea Star Ballroom which overlooks the Peconic River and is perfect for traditional receptions, and the Terrace Room, ideal for bridal showers or post-nuptial brunches. Room blocks are available at the adjacent waterfront Hyatt Place East End & Resort Marina, featuring 100 state-of-the-art suites, a 24-hour fitness center, indoor and outdoor swimming pools, complimentary Wi-Fi access and more. The WATERFRONT Suite offers a luxurious honeymoon suite with all the aforementioned amenities plus a living room, dining room, kitchen and king-sized bedroom. 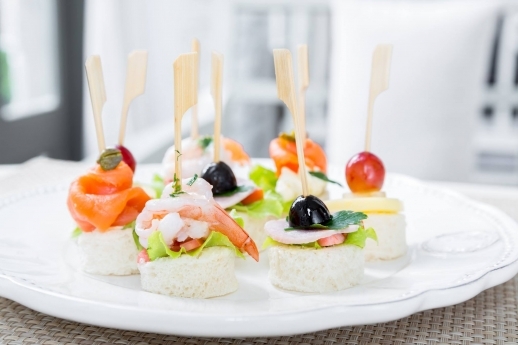 Our location is much different and more unique than any other catering facility in country. 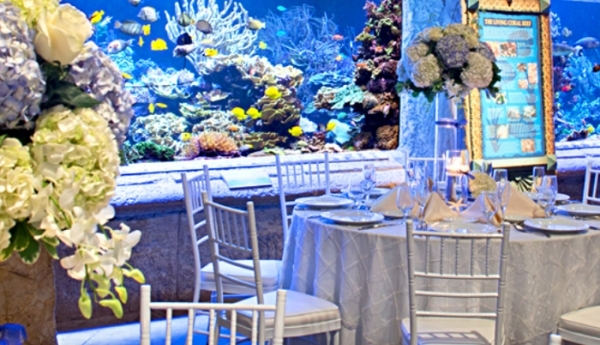 Being that our catering facility is also an aquarium, every affair is presented right in the middle of all of our beautiful aquatic displays. Our living walls create a one of a kind background. 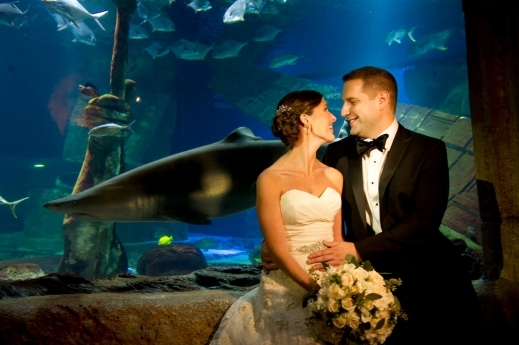 People can even get married underwater in our shark dive cage, or schedule a shark dive during their event. 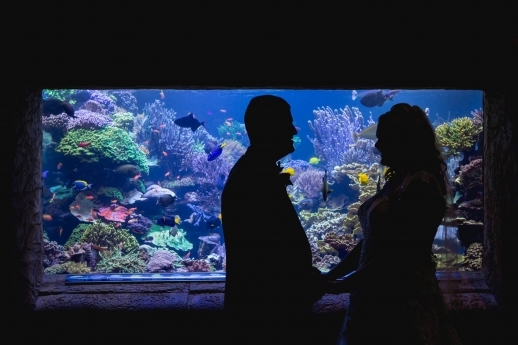 From outdoor cocktail hours, around our Koi Pond and next to our Salt Marsh, to elegant upscale weddings held inside our main indoor aquarium with tables placed right in front of the western hemisphere’s largest all living coral reef tank. What also makes us special is our unparalleled level of excellent service, and our world class chef Sean Fountaine. We decided to go into the wedding industry because we wanted to help couples create the most beautiful and special memories of the most important day in their lives. This day is not only important and special to them, but also to their parents and relatives, as well as their guests. When a couple decides to get married at our facility, they have so many choices of where to have their ceremony, it is truly hard for them to decide! 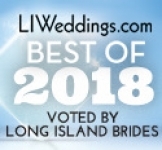 They have choices of getting married on our dock, in front of our spectacular waterfall, in our beautiful indoor chapel or in front of any of our outdoor or indoor exhibits. 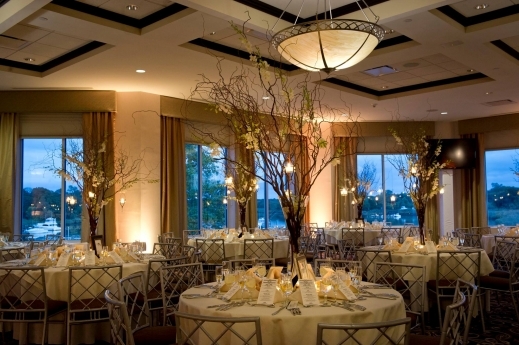 With so many choices for ceremonies, and reception locations, it was a natural progression to go into catering to both weddings, as well as bar and bat mitzvahs, sweet 16’s, corporate clients and fundraiser clients. Tell us about some of the most unique events you’ve hosted? How would your describe your wedding day mission? Our wedding day mission is simple. 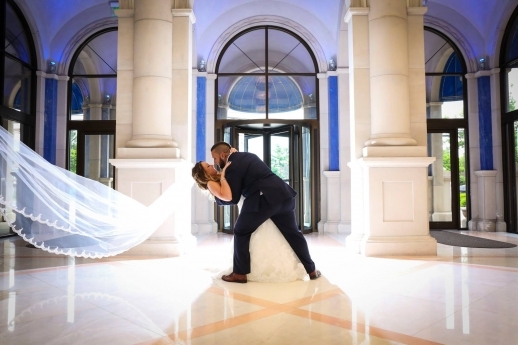 It is to help our clients to create the most unique, special, and magical experience of their lives, when they get married here at Atlantis Banquets & Events. It is to make them feel like kings and queens, and to cater to their every wish on their special day. 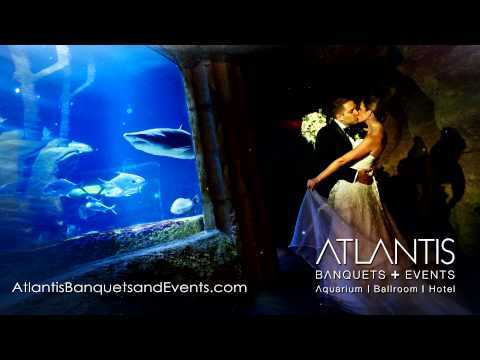 Our expert wedding planners here at Atlantis Banquets & Events suggest, that the first thing a couple does after they get engaged, is to find the location that they want to have their reception, and choose a date for this special event in their lives. We suggest a minimum time frame of one year, so there is plenty of time to plan all of the intricate details of their wedding day. Sometimes this amount of planning time is not available due to many different circumstances. 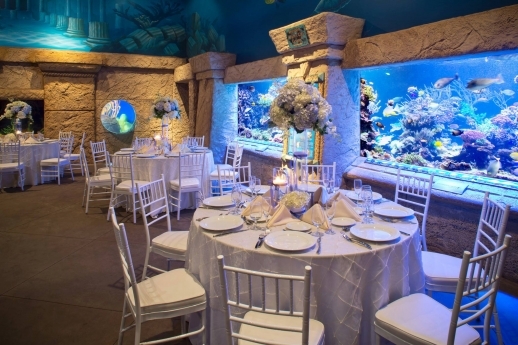 At Atlantis Banquets & Events, our expert wedding planners will hold our client’s hand through this process in as little time as just a few weeks. 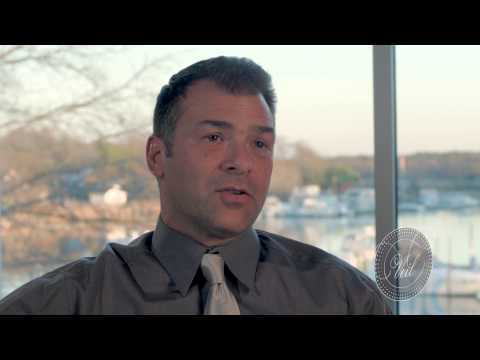 Executive Director, Bryan DeLuca discusses Atlantis Banquets and Events, including the Long Island Aquarium and Sea Star Ballroom as unique and beautiful wedding locations. Watch Samantha Brown from Travel Channel visit Riverhead, NY's Atlantis Marine World Aquarium and experience Shark Dive!